Tired of the same old smoothie? 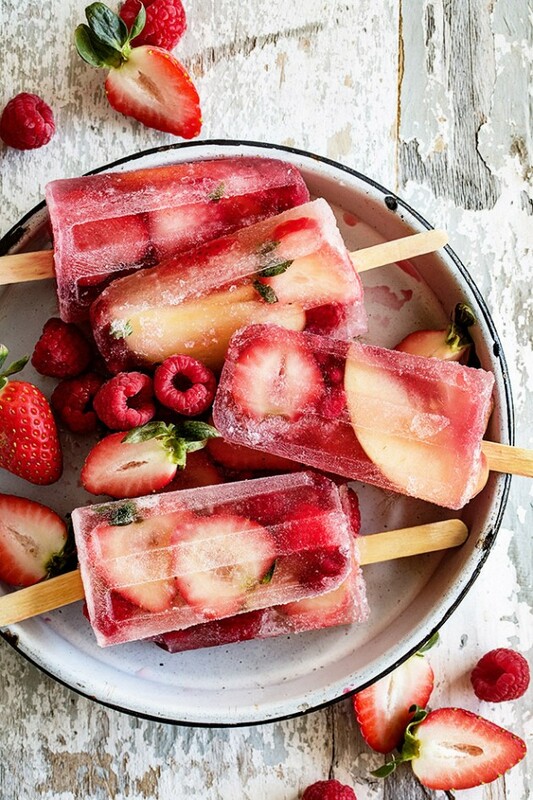 The weather is just going to get hotter, so frozen snacks are lifesavers! 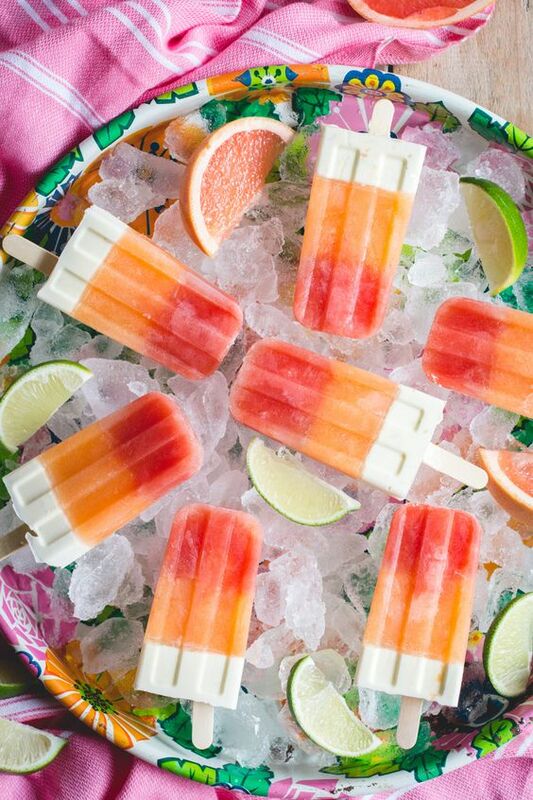 With a little planning, you can pack your freezer with our favorite popsicles. Terrific for kids and adults alike, these tasty treats work as a quick breakfast or easy snacks. Make them on a mellow night and enjoy them the rest of the week. If you’re hosting a party or are looking for something to bring, these recipes are a surefire hit! Our first recipe starts with a crunchy bite of granola. 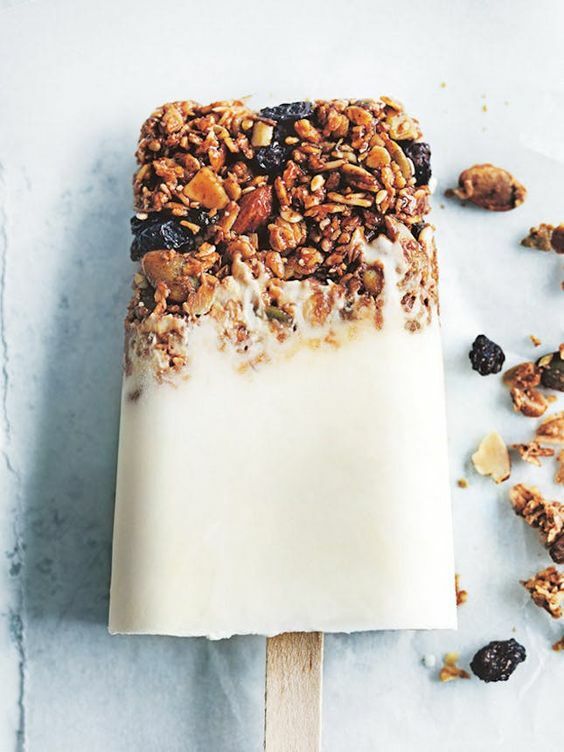 Yogurt granola popsicles take very few ingredients and are relatively low in sugar. The recipe calls for date syrup, which sweetens the Greek yogurt base. We recommend making your own date syrup with medjool dates and a food processor or blender. Click herefor the recipe and full instructions. Makes 8. If you love the crunch of granola, you might also like one of our rhubarb crumble recipes. Just sayin’. 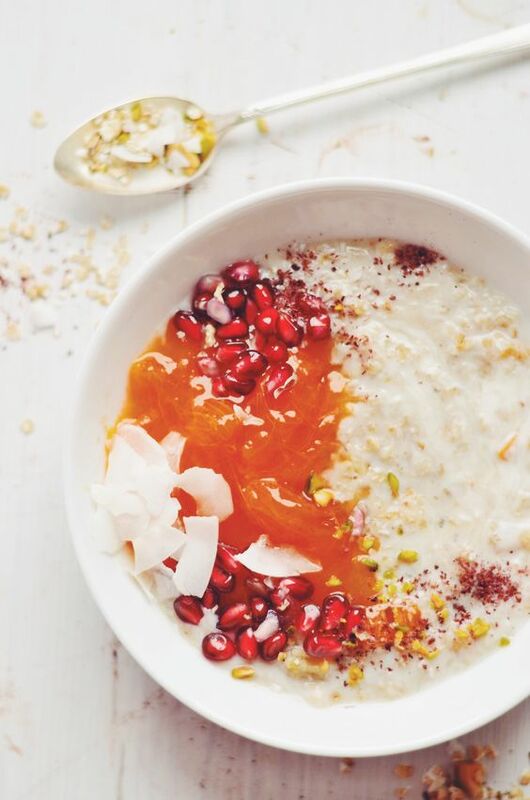 Here is another yummy recipe using yogurt as a base. 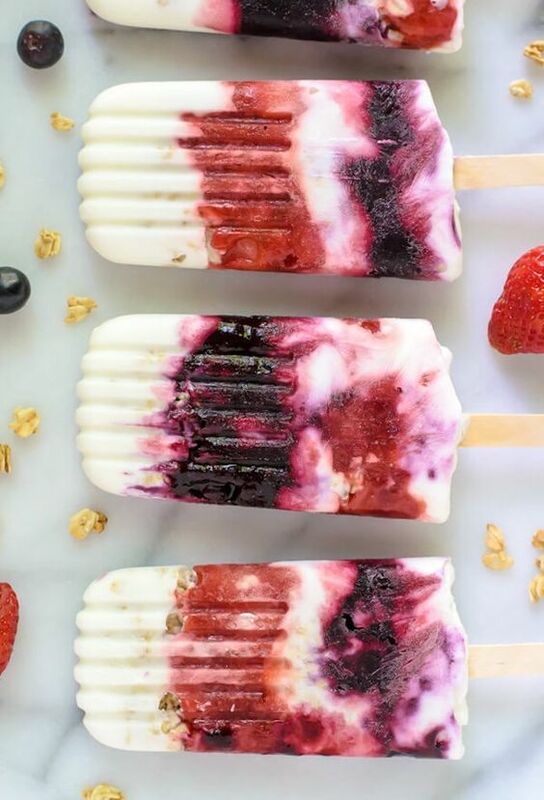 Packed full of seasonal berries, these popsicles are super healthy and taste amazing! (For you non-farmer’s market goers, they are even easier with frozen berries, too.) Using honey as a natural sweetener, berries are simmered into a jam. Layer flavors for a pretty striped breakfast treat! 3 cups fresh or frozen fruit, roughly chopped if large: strawberries (about 1 1/2 pints), cherries, whole blueberries, raspberries, peaches, blackberries, plums—pick your favorite! Music Alert! 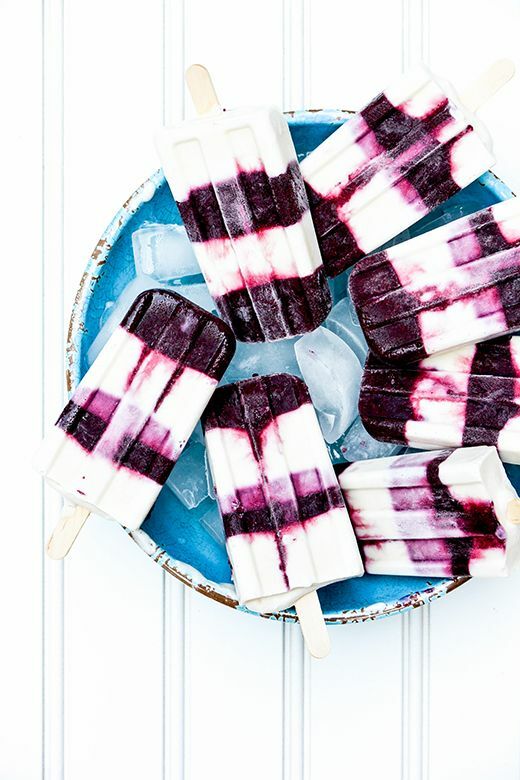 Need popsicle-eating music? Here’s my latest crush Purple by N’to for ya’. Seven flavor layers? Okay! 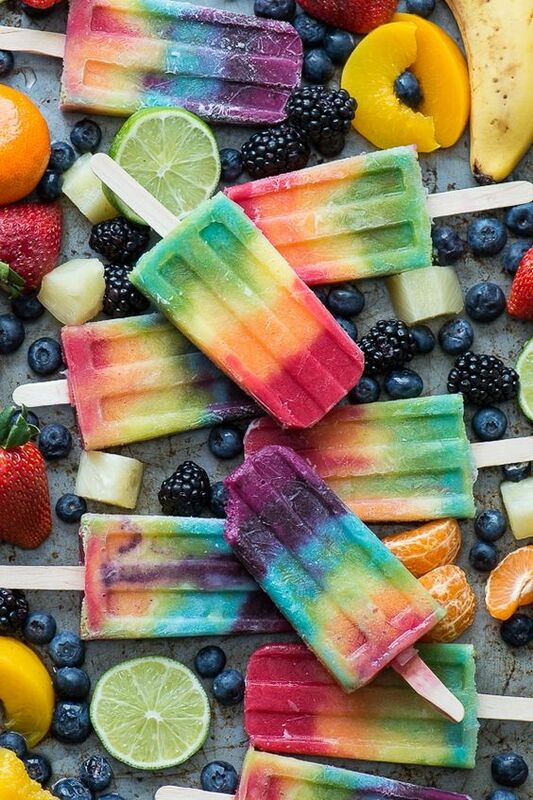 These 7-layer Rainbow Popsicles are made with lots of fruit and are basically like a smoothie you can eat. Each layer is a combination of yogurt of choice, fruit, and a frozen banana or two. If you’re trying to do the low-glycemic thing, we recommend cutting the banana quantity in half. (Learn more about low-glycemic fruits and veggies in our Green Smoothie article.) Each layer is like it’s own smoothie, so we suggest making a triple batch, because these are highly addictive! Click here for full ingredients list and yummy recipe. 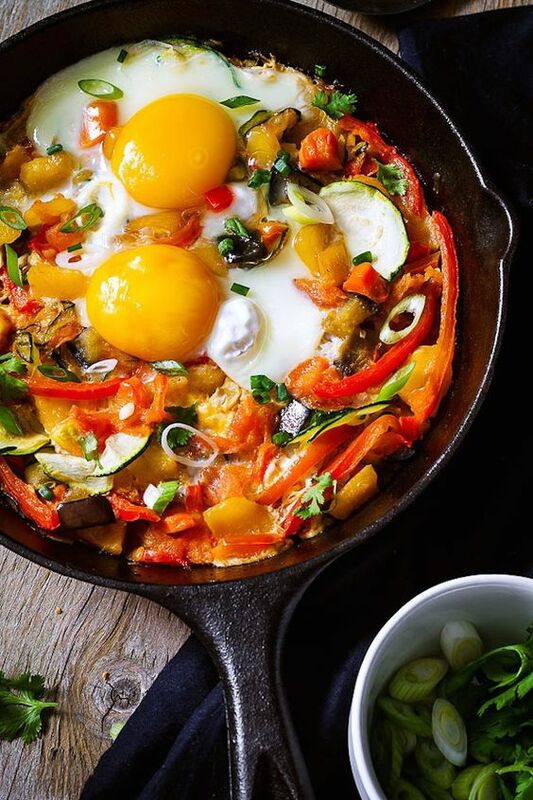 Yay for the layers that include veggies! If you have a thing for peaches or cashews (or both) look no further. 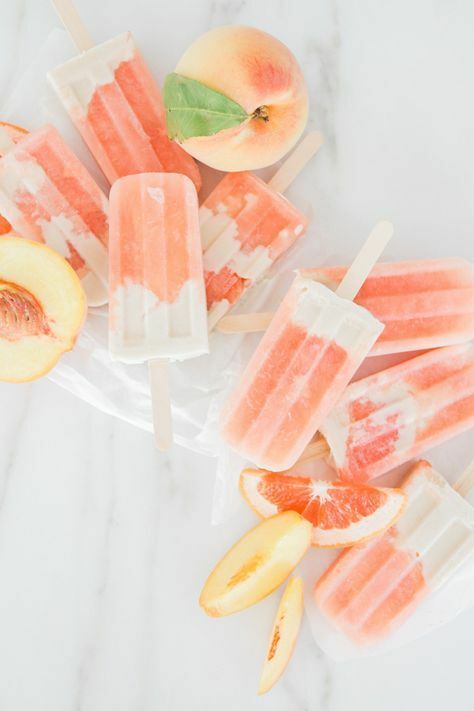 These Grapefruit and Peach Cream Popsicles will have your mouth watering in no time. Puree a grapefruit, add a little coconut cream, and 2 cups of white peaches. (Oh yes, we went there with the coconut.) If you add a splash of rum, we wont tell. BTW, we do this recipe without the simple syrup and don’t miss it. Or, you can make your own low-glycemic alternative as well. Click here for the full recipe and instructions. Trust us, you cant mess this one up. Totally perfect for showers and parties. This “pretty in pink” treat has three distinct layers. One of our favorite popsicles on the list starts with a watermelon layer. And you know how we love the hydrating effects of watermelon! The next layer progresses to cantaloupe. Finally, you are rewarded with sweet creme fraiche mixed with elderflower liqueur. (We also think that you could easily add a little rose water into the mix to enhance the floral notes.) Pretty fancy! We also love this one as party favors or a sweet midnight snack. Best when you or someone you love deserves a minor indulgence. Click here for ingredients and easy-to-make recipe. The trick is gathering those ingredients. The rest is a snap! And totally worth the effort if you’re hosting an adult party to remember. Our final recipe comes from our love of all things protein (even in cookies). The combination of spinach and flax seeds are sweetened with banana, pineapple juice, and coconut milk. You can also use kale or wheat grass in lieu of spinach, and play around with the amount of sweetness. If you want distinct layers, you will need to freeze each one for 30 mins before pouring the next one. We do a triple batch of these as well, to make the time worth it. This is perfect on the way to Pilates class or the beach on a hot summer day! Once you make a few of the recipes, you can start getting creative with fruits, liquids, and layers. 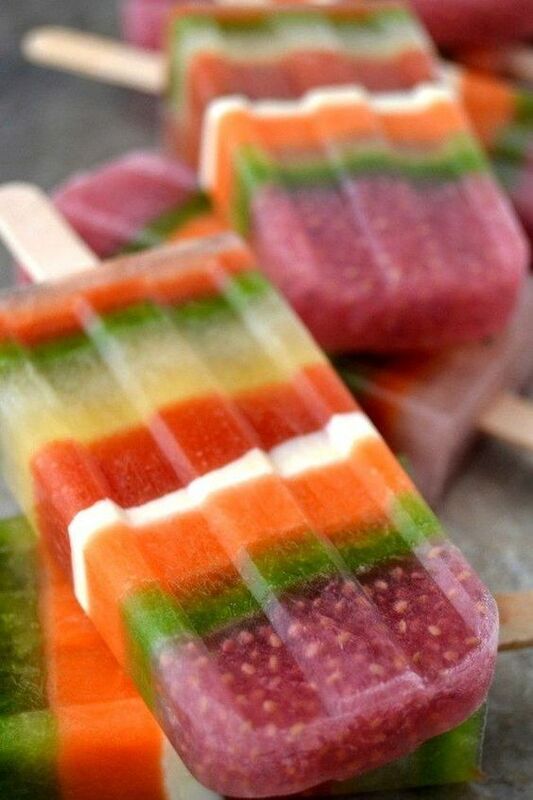 Making popsicles is easy and fun; get the right equipment and go to work! Use generous containers (like these silicone molds) and always have plenty of wood sticks on hand. Dessert can be as easy and festive as champagne poured over sliced fruit. Be sure to make enough to share!